… there is nothing superior to them in their kind; subtlety, grace, lightness, correctness, facility, expression, there is no quality that one might wish for which they lack, and he will always be considered one of the greatest and best draughtsmen that France has ever produced … I have often seen him out of temper with himself because he was unable to convey in painting the truth and brilliance he could express with his crayon. 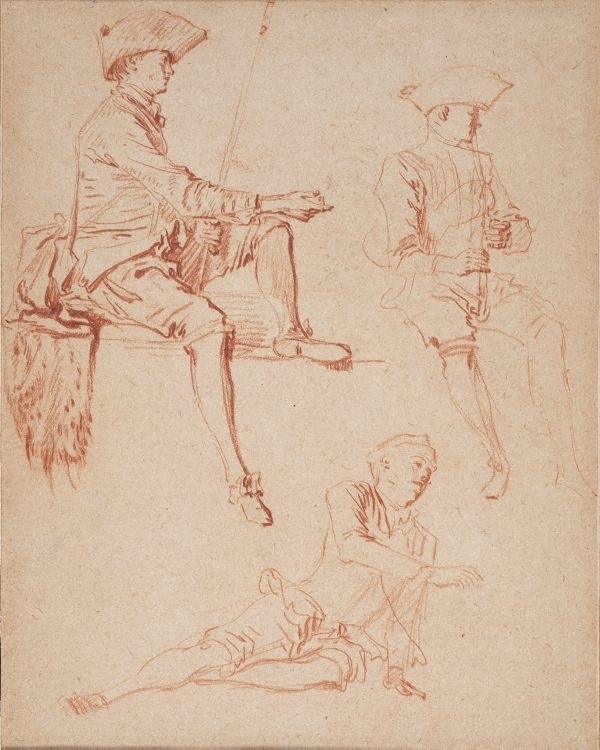 Watteau’s favourite drawing medium was red chalk and he continued to use it throughout his career, even after adopting the more elaborate graphic technique of trois crayons – the combination of red, black and white chalks for which he is renowned. The Gallery’s drawing has been dated to around 1713–14 at the very moment when Watteau began to handle his preferred medium with breathtaking dexterity. The drawing shows a young male model depicted in three different poses. Watteau’s attention to the artful placement on the sheet of the separate figure studies – both in relation to each other and to the edges of the paper – creates a striking composition in itself, and the elegance of this drawing’s mise-en-page is unmatched among the artist’s work in red chalk. Watteau must have worked with an incredibly – impossibly – sharpened stick of chalk as he set about lightly sketching the outlines of the figures. Apparently laid down in quick succession and with unerring fluency and precision, the studies were next worked up to varying degrees of elaboration with sharp, darker accents, which add expressive interest and suggest details and shadows. Watteau used two of the figures in the drawing for his painting Love in the French theatre (opposite, below). The figure playing a bagpipe in the drawing appears on the left side of the canvas, among the musicians and chorus who have gathered in a grove to perform an intermezzo in a comic opera. The lounging figure sketched at the bottom of the sheet was the inspiration for the central character in the painting: by crowning him with a vine wreath and placing a wine glass in his raised hand, Watteau reinvented him as Bacchus. He appears in an identical pose in the painting, clinking glasses with Cupid. The third and most fully worked up study – the figure holding a staff and sitting on a leopard skin with his right leg dangling casually – does not appear in any of Watteau’s known paintings. I must admit that in general [Watteau] drew without a purpose. For he never made an oil sketch or noted down the idea, in however slight or summary a form, for any of his pictures. It was his habit to do his drawings in a bound book, so that he always had a large number that were readily available … When it took his fancy to paint a picture, he resorted to his collection of studies, choosing such figures as suited him for the moment. Watteau’s method of posing and sketching models without a future composition in mind was decidedly unorthodox by established academic conventions. The drawings he gathered into albums provided him with a rich repertory from which he selected and combined unrelated figure types when painting his fêtes galantes (outdoor scenes of amorous dalliance enacted by figures partly in historical or theatrical dress). This individual approach, unfettered by the demands of composition, means that at their best, Watteau’s drawings have a natural sprightliness and immediacy of observation combined with an air of dreamy mystery and refinement. Edmund Capon, Great philanthropists on trial : the art of the bequest , 'The James Fairfax collection', pp 126-135, Melbourne, 2006, p 131. M. Morgan Grasselli, The Watteau Society Bulletin [vol. 3] , 'U.S.A. News', p 51-60, 1994, p 55. Bruce James, Art Gallery of New South Wales handbook , 'Western Collection: Works on Paper', pp 78-92, Sydney, 1999, illus p 81. Peter Raissis, Look , 'Early European works on paper', pg.20-23, Sydney, Aug 2014, col illus p 21. The drawings of Antoine Watteau , London, 1931, p 30. Prints & drawings Europe 1500-1900 , Sydney, 2014, p 74, col illus p 75. Art Gallery of New South Wales Annual Report 1994 , Sydney, 1994, illus p 10, p 44.